Between 1994 and June 2010, government built over 2,7 million homes for South Africans, giving shelter to more than 13 million people. 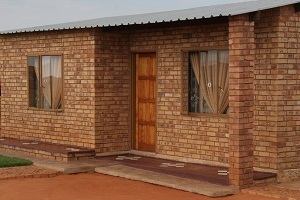 Spending on housing service delivery increased from R4,8 billion in 2004/05 to R10,9 billion in the 2009/10 financial year. Yet, there are still thousands of informal settlements across the country and more than 12 million South Africans are still in need of proper homes. Human Settlements Minister Tokyo Sexwale has acknowledged that the demand for housing in South Africa remains very high and that the government will need to speed up its plans to address a backlog estimated at over two-million homes. Meeting the challenge, 570 housing projects have been approved and a housing grant of R12,4 billion allocated for the 2010/11 financial year, translating into the construction of 226 000 new housing units across all nine provinces. Managing Director of Corobrik, Dirk Meyer, said that delivery of quality housing to the indigent was not government’s responsibility alone. Speaking during the run up to World Habitat Day on 3 October, he said that the private sector had an important role to play when it came to offering sustainable solutions able to address the housing shortage in South Africa. “The United Nations has set aside the first Monday of October of every year as World Habitat Day for us to reflect on the state of our towns and cities and the basic right of all to adequate shelter. While calling attention to bigger issues such as the current state of the human habitat and the need for dismantling deeply entrenched systems that reinforce and entrench poverty housing is important, on-the- ground solutions need to take centre stage. This has to include building materials that offer a better quality of life at a low built cost and with low life cycle impacts on the environment,” he said. Meyer explained that CoroJem face brick is particularly suited to this. The CoroJem is essentially twice the width of a standard brick and laid as a single skin – offers a solution that is applicable across a wide spectrum - from low cost subsidized housing (at 40sq/m) into gap housing (80 sq/m) and affordable housing (80 sq/m) arenas. “The CoroJem has proved itself as a best fit solution, meeting important affordability with quality and sustainability criteria while addressing people’s aspirations to live in ‘proper’ houses,” he said. Meyer pointed out that Corobrik’s CoroJem face bricks were essentially a response to government’s call for quality, inexpensive and maintenance free houses. In a relatively short period of time we have seen the CoroJem emerge as a frontrunner for the holistic solution it affords. The positive characteristics of the CoroJem include affordability, structural strength and longevity, flexibility in design and application, natural sound proofing qualities, incombustibility assuring natural resistance to fire, solidity and security. The enduring natural earthy colours and textures of clay face brick walls significantly reduce maintenance costs in a segment where such savings are really meaningful. On top of that occupants have the thermal comfort advantages that clay brick walls naturally provide, particularly in helping keep occupants cool in the long hot summer periods and warm in winter. 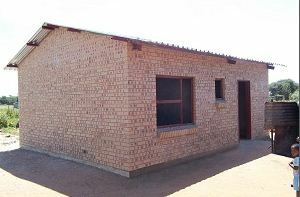 “Comparative studies undertaken by WSP Green by Design show face brick building as the most viable way forward for house construction in South Africa, this because of its competitive built cost, greater thermal comfort, lowest life cycle energy costs and lowest overall life cycle costs. While double skin clay brick construction is the clearly the ‘optimal’ way forward, the CoroJem is a sound performer with all the functionality of a face brick. Double skin walling is approximately 20% more expensive in the wall than CoroJems through the wall format. This translates into saving on mortar and labour, reducing the overall costs of CoroJem construction,” he added. In the recent past, Corobrik has secured orders for over 40 million CoroJem face bricks to build more than 11,000 affordable homes in the Free State and Northern Cape. CoroJems are currently manufactured at Corobrik’s Free State and two Gauteng factories with plans advanced to extend production to Corobrik’s KwaZulu-Natal operations later in 2011. Corobrik’s CoroJem face brick, manufactured in Red Travertine, Corngold Satin, Classic Travertine and Manor Travertine has been used to construct 11 000 affordable houses in the Free State and Northern Cape. The United Nations has set aside the first Monday of October of every year as World Habitat Day for us to reflect on the state of our towns and cities and the basic right of all to adequate shelter. While calling attention to bigger issues such as the current state of the human habitat and the need for dismantling deeply entrenched systems that reinforce and entrench poverty housing is important, on-the- ground solutions need to take centre stage. This has to include building materials that offer a better quality of life at a low built cost and with low life cycle impacts on the environment. For more information contact Peter Kidger on 031 560 3233. Statistics extracted from Government website.